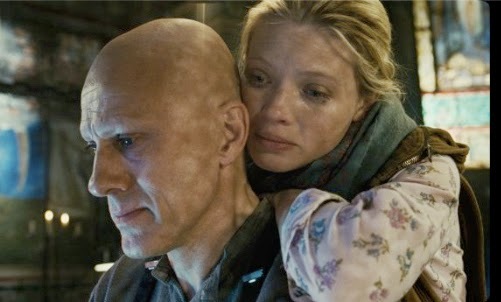 Director Terry Gilliam's bombastically bizarre "The Zero Theorem" is a mash-up of themes, stylistic touches and character types from many of his past works, but fails to add up to the sum of those parts. Although this extended existential allegory is worth seeing if only to marvel at its colorfully hyper-imaginative sets and Gilliam's trademark retro-futurism (here executed by "The Imaginarium of Doctor Parnassus" production designer David Warren), the insubstantial screenplay by first-timer Pat Rushin spends far too much time getting to its "is there a point" point. Christoph Waltz stars as Qohen Leth, a miserable but tech-savvy "entity crunching" recluse in a world of omnipresent advertising pitches and oppressive overstimulation. He lives alone in a rat-infested burned-out chapel that has the same appearance of artfully disheveled deterioriation as the theater in "The Adventures of Baron Munchausen." A Big Brother-like corporation head known only as Management (a coolly remote Matt Damon) has tasked Qohen with proving that everything in the cosmos adds up to nothing. Qohen spends the next several months obsessively rearranging parts of mathematical equations represented by flying blue cubes in an elaborate video-screen world, where massive structures occasionally and quite frustratingly collapse. Meanwhile, his every move is monitored by security cameras, including one that rather symbolically has replaced a crucified Christ's missing head. Like Harry Tuttle in Gilliam's "Brazil," Qohen dreams of escaping the dreary repression of his drone-like existence. The difference is that Qohen's idea of salvation isn't a fight-the-power adventure fantasy but his hope that he will get an enlightening phone call from whatever passes for God, telling him his purpose in life. He thinks that he managed to miss that call once when he dropped the receiver, so now he answers every ring with a desperate hopefulness that instantly turns to despair. His cartoonishly effusive supervisor Joby (David Thewlis) invites the joyless Qohen to a senses-assaulting party that's like something out of "Fear and Loathing in Las Vegas," only without the lizards. Also on the positive side, the dismally dark Qohen's desire for cosmic redemption isn't nearly as silly or sappy as nutjob Parry's quest for the grail in the "The Fisher King." The problem is that too much of "The Zero Theorem" seems more self-consciously eccentric than involving on a story level. Qohen's teenage collaborator Bob (Lucas Hedges) is entertainingly sarcastic, and his virtual-reality love interest Bainsley (Mélanie Thierry) is distractingly amusing, but would-be emotional beats involving those characters seem hammered in and unconvincing. The film's climax isn't as moving as the somewhat similar ending of "Brazil," and what should be its transcendent big-reveal moment isn't nearly as emotionally powerful as the finale of "12 Monkeys." The philosophical question at the heart of the film is summed up by Bob telling the overworked and overwhelmed Qohen, "You better get your call, before you prove that nothing is calling." Unfortunately, this meandering movie takes too long getting around to delivering its own message.